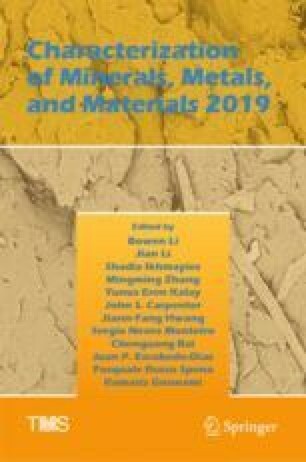 Precipitates in slabs, hot-rolled plates, cold-rolled plates, and annealed plates of a non-oriented electrical steel were investigated by automatic scanning electron microscope (ASPEX) and field-emission scanning electron microscope. The composition, size, and number density of precipitates were analyzed. Thermodynamic analysis was performed by FactSage@7.1. The calculated precipitation temperature of MnS and AlN were 1218.5 °C and 1186.7 °C, respectively. Due to their similar precipitation temperatures, AlN and MnS always co-precipitated and formed complex precipitates. The analysis results by ASPEX also revealed that precipitates increased sharply in hot-rolled plates. In slabs, co-precipitates of AlN-MnS were relatively less and larger, for the cooling rate during continuous casting was very low. It is deemed that part of precipitates would re-dissolve during reheating process and tended to precipitate along the dislocation line during the hot-rolling process. After the cold-rolling process, AlN tended to be broken, while MnS particles showed plastic deformation along the rolling direction. The authors are grateful for support from National Science Foundation China (Grant No. U1860206), the Fundamental Research Funds for the Central Universities (Grant No. FRF-TP-17-001C2), Beijing Key Laboratory of Green Recycling and Extraction of Metals (GREM) and the High Quality steel Consortium (HQSC) and Green Process Metallurgy and Modeling (GPM2) at the School of Metallurgical and Ecological Engineering at University of Science and Technology Beijing (USTB), China.